I wish I had seen director Peter Jackson’s The Hobbit: An Unexpected Journey at the normal 24-frames-per-second rather than the hyper-vivid 48-frames-per-second at which the movie is being shown at certain locations, apparently to give it the kick of extra clarity. 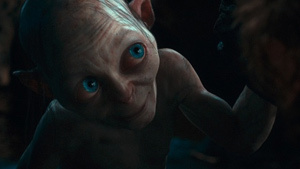 When combined with 3-D, The Hobbit’s high-def look proved so distracting that I had difficulty finding a way into J.R.R. Tolkien’s story about Bilbo Baggins’s quest to help a group of dwarves reclaim their homeland. After the Hobbit screening, I checked with a couple of fellow critics. Averaging our responses, it probably took us somewhere between 30 to 40 minutes to settle into Jackson’s film, which is nearly three hours long. Watching The Hobbit, you may feel roughly the same sense of forced wonder you might experience while observing the latest super-dooper, high-def TV in the showroom of some big-box store. It seems plenty spiffy until you remember that you neither have the need nor the desire to see every bit of stubble on some anchorman’s face. And if you’re a cineaste, the nuanced richness of film probably does a lot more for you than the shocking acuity of the images you’ll find in The Hobbit. Put another way, instead of liberating the material in The Hobbit, technology seems to imprison it. If you can get past Jackson’s visual approach, you may find (at least I did) a story that doesn’t fully engage until its final hour. Encumbered by lots of expositional foot-dragging, The Hobbit works in bits and pieces, some spectacular, some dull. In this predecessor to Tolkien’s more elaborate Lord of the Ring novels — already made into three blockbuster entertainments by Jackson — Bilbo Baggins (Martin Freeman) is recruited by the wizard Gandalf (Ian McKellen) to help a troupe of dwarves regain the mountain kingdom they lose in the movie’s action-oriented prologue. Attracted to gold, a dragon — Smaug by name — expels the dwarf population from Lonely Mountain. Having become too gold-hungry for their own good, the dwarves are driven from their mountain Eden. There’s no faulting the performances which include brief appearances from Cate Blanchett (as Galadriel), Christopher Lee (as Saruman) and Hugo Weaving (as Elrond), but the burden of breaking the novel into three separate movies can’t help but take its toll. Many scenes are extended well-beyond necessity, and the movie includes stretches that are talky enough to make you wish these damned dwarves would pick up the pace. Early on, Bilbo’s peaceful home is invaded by dwarves who disturb his much-valued tranquility and eat everything in his well-stocked larder. Sagacious as always, Gandalf seems to know that the reluctant Bilbo eventually will answer duty’s call. When this dwarf crew — led by Thorin (a majestic Richard Armitage) — takes to the road, the movie falls into a pattern in which talk alternates with action. Jackson and the four writers who receive screenplay credit for The Hobbit would have done well to look up the word “adaptation;” it doesn’t mean the same thing as “expansion.” I know the legion of Tolkien fans demand careful detailing, but I could have used with some concision, particularly in a screening that required wearing 3-D glasses. In Jackson’s telling of the tale, the quest to reclaim a homeland sometimes feels like a forced march. The well-cast Freeman tends to look less like a Hobbit than an aging Beatle, but for all its distractions, the force of Tolkien’s story ultimately prevails. If you hang in long enough, you will be rewarded by a final battle that takes place on footbridges in a goblin cave that’s home to the Great Goblin, a blubbery creature with a beard-like growth on his face, a sagging sack of skin that has a tendency to sway. You’ll also get an amusing sequence in which Andy Serkis — sounding like a cross between Peter Lorre and Daffy Duck — reprises his role as Gollum, this time playing a game of dueling riddles with Bilbo. Look, I ultimately got involved with The Hobbit, but I hope that in the next two outings, Jackson pays less attention to technological wizardry and more to expeditious storytelling. I say this because it’s already too late to wish that he had made one compact and totally involving film instead of committing to three.